Regarded by many as the genesis of gangster rap, this album marked one of the turning points in hip hop. I'm not sure which is more menacing, KRS's fierce delivery or Scott's raw head-knocking rhythms. Even the cover, featuring both men cloaked in weaponry, was the first of its kind. Hip hop was never the same. 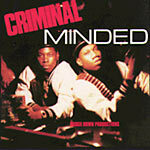 All cuts Written and Produced by KRS-One and Scott La Rock.